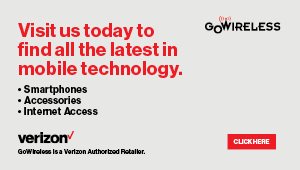 For a limited time, stop by your local GoWireless store and pick up two of your favorite style phones for the price of one! See store for full details. This weekend only, all GoWireless customers will receive 25% off all power and accessory products by the premier brand Belkin. Belkin creates people-inspired products and solutions. For more than 25 years Belkin has been on a mission to create products that make people’s lives better, easier and more fulfilling. Belkin products leverage technology to connect the dots between people, their activities and experiences they love.